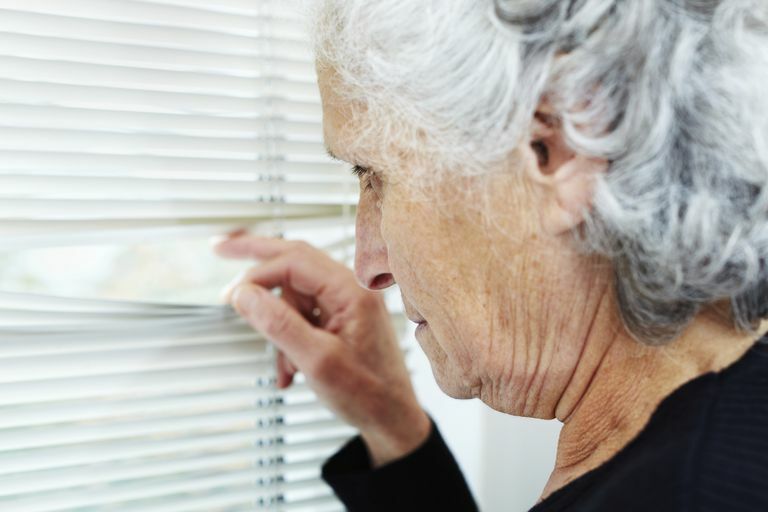 Paranoia and delusions can sometimes develop in people who are living with Alzheimer's or other types of dementia. Developing a greater understanding of these behaviors and feelings can help you be able to more effectively cope with, and respond to, these challenges. Paranoia is an unrealistic fear or concern that harm is imminent or that others are out to get you. A paranoid person does not generally accept other explanations and may blame you if you try to use logic to reason away their fears. Some people experience paranoia if they have a psychological disorder like schizophrenia. Others develop it in relation to different medical conditions, including Alzheimer’s, other types of dementia or delirium. Delusions are fixed (not easily changed) false beliefs. Dementia often results in paranoid delusions, where there may be a fixed belief that someone is poisoning the food or stealing money. Other kinds of delusions are less common in dementia, such as delusions of grandeur, where there is the false belief that one has extra power or a higher position in society or the world. Alzheimer’s can change the way others are perceived. For example, you may have always had a good relationship with your father and are trying to help him with his finances. Instead of being grateful for your assistance, your father, who has Alzheimer's, might accuse you of trying to take his money or "pull one over" on him. Or, perhaps your favorite nursing home resident suddenly accuses you of poisoning her medicine and refuses to take her pills. Approximately 30 percent to 40 percent of people with Alzheimer’s will develop delusions at some point during the disease, many of them being paranoid delusions. The incidence may be increased in those who have a history of abuse or trauma. Delusions appear to be more common in vascular dementia as well as in Parkinson’s-related dementia and dementia with Lewy bodies. Up to 70 percent of people with Lewy body dementia (which includes both Parkinson's dementia and dementia with Lewy bodies) experience delusions or hallucinations. Could Paranoia or Delusions Be a Sign of Delirium? If paranoia or delusions are a new behavior for your loved one or someone you’re caring for, consider the possibility that she might be experiencing delirium. Delirium is a sudden change in thinking and orientation, usually quite reversible, brought on by a physical condition such as an infection, surgery or other illness. How Can You Decrease the Likelihood of Paranoid Delusions? Be careful what television shows are playing in the background. To you, it might just be background noise, but to a person who’s confused, violent or fear-provoking shows may trigger fear and paranoia for that person. For the person with Alzheimer’s, the line between reality and fantasy can easily become blurred. Ensure that your loved one is receiving the correct medication doses. Too much or too little medication can affect a person’s mental and emotional stability. If you’re providing care for someone in a facility, try to keep the routine as consistent as possible. A regular rhythm of the day and familiar, consistent caregivers help reduce anxiety and stress for people. You may also need to consider the possibility that their fears are accurate—that someone is actually taking advantage of them. Older adults can be vulnerable to different types of abuse, including financial and physical. Most delusions in dementia really are delusions, but a healthy awareness (not constant suspicion) of others is the better part of wisdom.